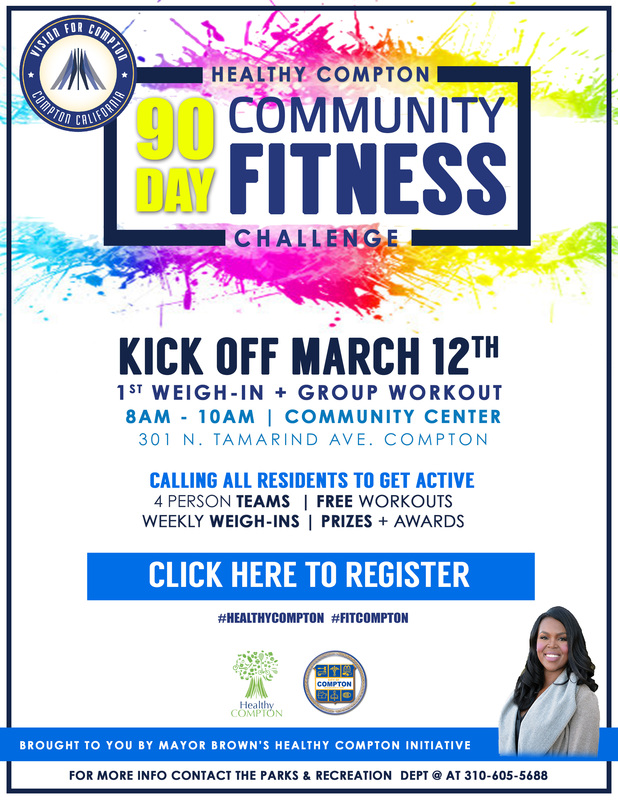 COMPTON – On March 12, Compton Mayor Aja Brown’s Healthy Compton initiative will kick off a free 90-Day Community Fitness Challenge. Healthy Compton is a citywide fitness initiative created by Mayor Brown aimed to increase physical activity and promote a healthy lifestyle for anyone who lives, plays, or works in Compton. The first weigh-in and group workout will take place on Saturday, March 12 from 8 a.m. to 10 a.m. at the Douglas F. Dollarhide Community Center located at 301 N. Tamarind Avenue. Interested participants can sign-up online for free at www.comptoncity.org/fitness.asp. "The Healthy Compton initiative is an ongoing effort to promote health and wellness in the Compton community,” said Mayor Aja Brown. “This event is designed to motivate and equip Compton residents to lead healthier lives utilizing a fun team-oriented initiative. Healthy Compton’s Community Fitness Challenge will further our commitment to building a prosperous and thriving city in which our residents are the most important building block. A physically and mentally fit person strengthens the family unit and ultimately the Compton community. I’m encouraging all Compton residents to join us in this challenge. Let's do this!" Healthy Compton’s 90-Day Community Fitness Challenge is an opportunity to have fun, be active, and win prizes. It’s simple and fun and open to all ages. Individuals and teams of up to four people are encouraged to participate in group workouts and pop-up workout classes throughout the City. There will be special guests and awards and prizes. Follow Healthy Compton on social media with the hashtags #HealthyCompton and #FitCompton.